Jim Rohn a late entrepreneur, author and very successful multi-millionaire went from rags to riches. He is one of the most famous motivational speakers of all time and has many well known quotes. Although, in this day in age almost everyone has a big TV and Kindles and eBooks are shrinking the size of libraries, the phrase is still as pertinent now as it was back when he said it. What he was illustrating is that: Poor people seek to be entertained, Rich people seek to obtain. You may have already seen this very popular study circulating on Facebook and the internet called, “20 Things the Rich Do Everyday”, but in case you haven’t, I’ve shared it here. This study not only proves that Jim Rohn was correct, it also outlines other habits that those who want to ‘live richly’ should implement. As we are embarking on a new year this is a great list of goals to set for those who not only want to enjoy a richer life but who also want to set an example for their kids, siblings, employees, and/or those around them. I found the article here. (It was a study that compared habits between the rich and the poor). 20 Things the Rich Do Every Day- the differences of habits between the rich and the poor. 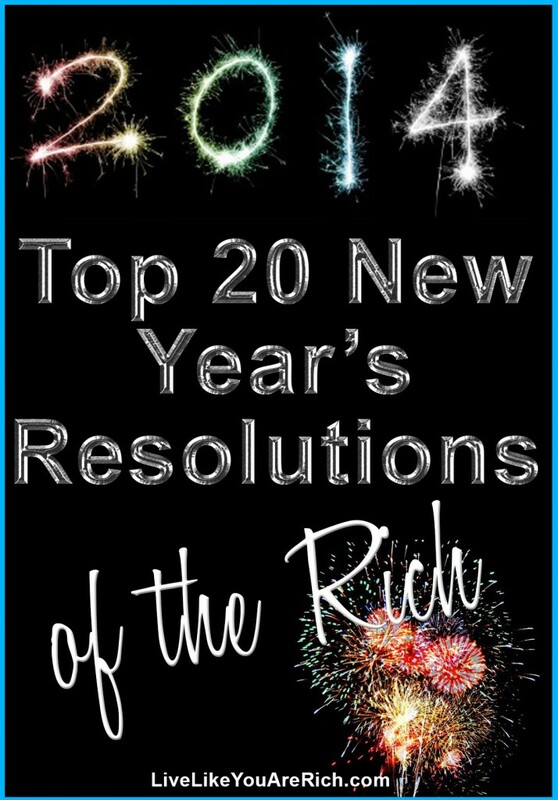 So using this list what could the top 20 resolutions to a successful year be in 2014 to live richly? 1- Eat less junk food. 3- Exercise 4 days a week. 4- Listen to Audio books on your commutes and drives. 5- Maintain a To-Do List. 6- If you have children, make them read 2 or more non-fiction books a month. 7- Volunteer and have your children (if applicable) volunteer for at least 10 hours a month. 8- Call people to wish them a Happy Birthday. 9- Write down your goals. 10- Read 30 minutes or more each day for education or career reasons. 11. Filter your thoughts and think through their consequences before you voice them. 12. Network 5 hours or more each month. 13. Watch on average less than 1 hour of TV each day. 14. Avoid watching reality TV. 15. Wake up a few hours before work starts. 16. Teach good daily success habits to your children (if applicable). 17. Believe that good values and work ethic create opportunities. 18. Believe that bad values and a poor work ethic diminishes opportunities. 19. Seek to be constantly learning and seek out education. 20. Learn to LOVE to read. Some of the richest people I know definitely incorporate many if not all of these points. Perhaps this list with help you shape your 2014 goals/resolutions and make it a richer year for you and your family as well. For other ‘living rich’ tips, subscribe to my blog, like my page on Facebook, and Follow me on Pinterest. Why Those Who Are Truly Rich Serve and Help Others Dr. Laura’s Review of Our Book Living a Rich Life as a Stay at Home Mom 9 Ways to Prepare Your Family for Catastrophes, Natural Disasters, Income Loss, and Economic Depressions. Great article Anita. Thanks for the reminder of what it’s like to reach for excellence. Your list was interesting but very simplistic. You need to be careful when giving a list of “quick” fix ideas for the differences between the poor and wealthy. Being poor and being rich are far more complicated and nuanced than your list implies. People who live in poverty spend an inordinate amount of thier time and energy just trying to provide the basics for themselves and their families. They [unlike the rich] usually do not have the support system or resources necessary that could help them to climb out of their situation. Some how in our country we have been lead to believe if you’re poor you are either lazy or there is something you’re not doing right. Let’s not perpetuate that myth. Maybe even volunteer to help people less fortunate than yourself which could be a start to a brighter future for them and their families. The rich and middle class can take care of themselves. Yes, everyone does have their different views. This list is to encourage others to start daily habits that create a way to get out of the poverty and create better lives.America is a great place for the poor to better their circumstances as well as the middle class and the rich. I took this from accurate research and two of the main points are about helping others and service which is a great suggestion you had. According the the statistics many rich people and their children do spend a lot of time helping others. The article is meant to show how someone who is less fortunate but ‘not lazy’ can better their circumstances. Or anyone for that matter.